Coming up with a budget doesn’t mean you have to live in a financial straitjacket; think about it as a plan of action. Take a look at your spending habits from the previous months and figure out where you can cut back on things you won’t really miss. For instance, you might skip that daily latte or cut back on eating out. Once you determine where you can spend less money, you will be able to prioritize and focus on saving for your goals, like owning a Minto Florida home! Change the financial behavior that got you into debt in the first place. Paying off debt takes time and patience, but this is something to be contentious of the following year so you don’t dig yourself into a deeper hole. Minimum payments are also financial traps and amount to maximum payments in the long run. Instead, double or triple the minimum payments. We’re not advising you become a contestant on an episode of Extreme Couponing, but coupons can add up to saving a great deal of money. There are many up for grabs in newspapers, magazines, online, in store and sometimes on the product you’re purchasing. Start by clipping out the coupons you intend to use and come up with a filing system that works for you. Some couponers like to organize their coupons by grocery categories, such as dairy, frozen foods, etc. Next, find a place to store your coupons for easy access. Regularly purge any expired coupons. It is also good to note that some stores do not always adhere to expiration dates, so it doesn’t hurt to ask if a store will still honor your “expired” coupon. 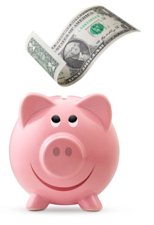 Have an emergency savings account in case something unexpected arises, such as a car repair or medical expense. That way, you won’t have to put a halt on your retirement savings or dip into that account. It’s convenient and easy to do since it comes right out of your paycheck, and if your employer matches, you’re essentially getting free money. The best part is you’re not getting taxed on those contributions. The more you put in, the closer you are to retiring. We all have things lying around our house that we don’t use anymore. Take a look in drawers, basements/attics, garages and decide what you can sell. You can sell them on websites, such as EBay, or hold a garage sale. What are your tips for saving money? We would love to hear them! Post them below in our comments section.